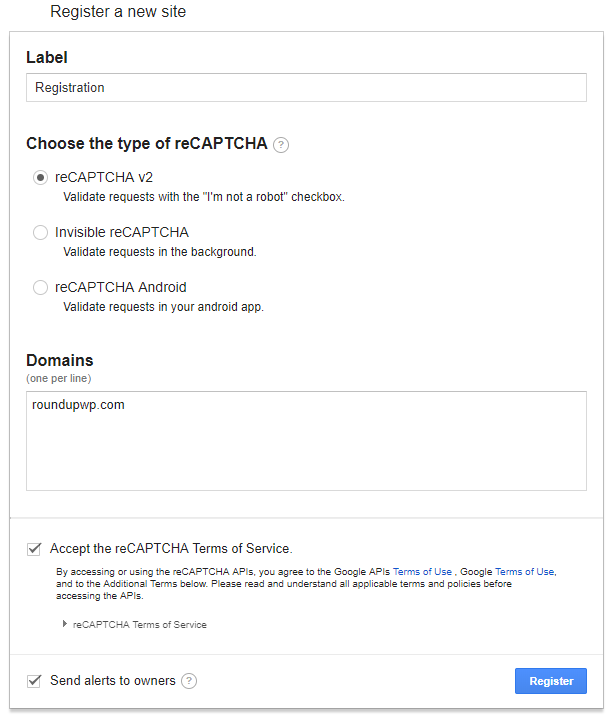 How Do I Get a Google reCAPTCHA Api Key? Google’s reCAPTCHA system is an easy and effective way to protect your forms from bots. With the Registrations plugin, you can easily use reCAPTCHA to ensure that all your registrants are real people. You’ve probably seen it before. Users click a simple checkbox before submitting a form, and Google figures out if the user is a human or a bot. If a bot tries to fill out your registration form, we will stop them for you. All you have to do is get an api key and add a recaptcha input to your form. Under “Label”, you can add a description to help you keep track of the recaptcha, such as the name of the form you are adding it to. Under “Domains”, enter the domain name of your of your site, e.g. “roundupwp.com”. Accept the terms and click “Register”. Under the “Keys” section, find your site key and the secret key. How do I add a recaptcha? Go to the “All Forms” page to edit your form. Find the “captcha (recaptcha)” input on the right. Paste your site key and secret key into their respective spaces. Go to the “Forms” tab. Find the “Recaptcha” form field.